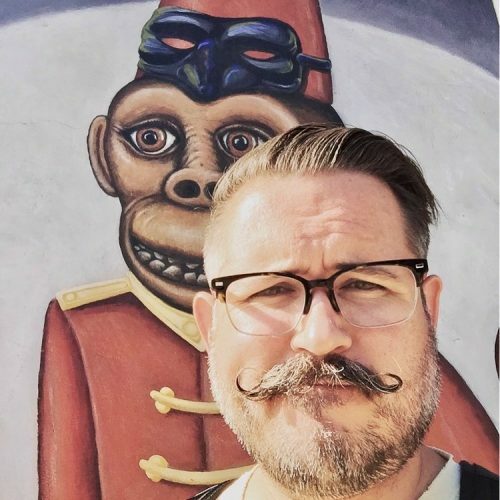 Sean Cawelti is a theater, opera director, video, puppet and mask designer based in Los Angeles. Sean graduated from the University of California Irvine with his BA in Drama with honors in Directing. He has been a puppeteer since he was four, after convincing his parents to buy him his first puppet while at a swap meet while growing up in Orange County. Sean studied puppetry at Tisch School of the Arts at NYU and is a member of the Puppeteers of America and LA Guild of Puppetry. Sean worked for many years as an Art Director at the California Science Center in Los Angeles. In 2012 Sean left his day job and became a freelance artist full time dividing his time between being the Artistic Director for Rogue Artists Ensemble and working as a Director and Puppet, Mask and Video Designer. Sean’s directing work has been seen at the Getty Villa, South Coast Repertory, Segerstrom Center for the Arts, Redcat, The Geffen Playhouse and the Center for Puppetry Arts in Atlanta. He has designed puppets, masks, props and video for theater, music videos, museums, concerts and arena tours including the recent Kanye West Yeezus tour.